See lower down for information on Thalidomide and the Northwick Park disaster. Many illnesses are undetectable in animals. For example, animals cannot explain that they’re feeling suicidal, suffering blurred vision, or aching joints. They may be incapable of developing the condition that a human suffers. For example, a drug which damages the spleen of a human will never do the same to the rat, which has no spleen. Often medications affect humans over years or even decades. Most lab animals will live a year at most. Attempts to overcome this by giving a higher dose over a shorter period are not effective. Perhaps the biggest obstacle is that animals react in a different ways to humans. It’s established from comparisons of human and animal data that animals are an ineffective way of predicting what a drug does to a human. An example of this was a study that looked at side effects that were detectable in animals. The undetectable ones (like hearing damage and depression) were ignored. Over half (54%) of the side effects were not detected by the animal tests. [Clin Pharmacol Ther 1962; pp665-672] This appalling statistic places animal testing alongside more obviously unscientific methods; flipping a coin would be 50% effective. Yet some defenders claim that identifying 46% of damaging side effects is useful information. Unfortunately it isn’t, as we see in our next statement. So, we can conclude that if animal tests say a drug’s safe, it’s more likely that it is damaging. If the animal tests say it has a risk, its most likely that the risk doesn’t actually exist. There are more of these statistics available, and you are encouraged to consult the page on this site dedicated to failure rates. 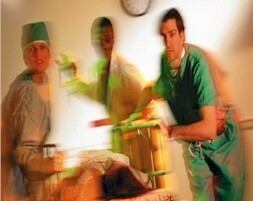 * The same study also considered patients who were so badly injured by medications that they needed hospital treatment. These were calculated to be 2,250,000 hospital admissions each year. That’s over 6,000 every day, or one every 14 seconds. * The financial cost of this is estimated at £466,000,000 per year, or nearly £900 every minute. The authors of the article concluded that the problems was the equivalent of using seven 800 bed hospitals to deal with nothing other than the effects of adverse reactions. * Questions have been raised in the House of Lords. Earl Baldwin of Bewdley noted to the House of Lords (2nd Nov 1998) that in the UK, a survey of that year found adverse drug reactions (ADRs) to be third in the list of causes of death - after heart attacks and strokes but ahead of cancer. Earl Baldwin also commented, "Consider the savings to be made in the hard-pressed NHS budgets in not having to deal with the aftermath of treatments"
It would be impractical to list all the drugs disasters over recent years. To follow are examples of three high profile ones, and some recent headlines. It was estimated that 88,000 to 139,000 Americans had heart attacks and strokes as a result of taking Vioxx, as many as 55,000 of them fatal. [Dr David Graham, associate director of the FDA's Office of Drug Safety, British Medical Journal 2004;329:1253] The arthritis medication was withdrawn after causing the largest medical disaster in history, yet animal tests indicated that it was entirely safe. A paper published in 2002 in Current Opinions in Lipidology showed that the painkiller was beneficial to mice in respect of their hearts, and concluded that it could even be used to treat atherosclerosis (heart disease). An unpublished study using African green monkeys was also used by the manufacturers to support claims that Vioxx was safe. Clearly, the animal data was indicative of safety. It was human studies in 2001, researchers at Cleveland Clinic that showed Vioxx posed a significantly greater heart attack risk than naproxen, an over-the-counter anti-inflammatory. It should have been banned then, but animal results were preferred to evidence from humans right up until it was withdrawn in September 2004. “Nine of 11 studies on mice and rats had shown Vioxx or other COX-2 inhibitors to be safe for animal hearts and blood vessels. In fact, six different animal studies—in four different species—showed Vioxx was actually protective against heart attacks and vascular disease. One researcher went so far as to suggest that Vioxx be considered a treatment for human cardiovascular disease, based on these animal tests. TGN1412 is a monoclonal antibody (MAB), a drug which stimulates the immune system. The testing of this drug was the first of a series of clinical trials, starting at one five hundredth (0.2%) of the clinical dose. For six young men who had been paid to be the first recipients, even this tiny dose was to spell disaster. Within minutes symptoms of agonizing pain and severe swelling were evident, and it was clear that this drug was extremely dangerous. A particularly aggressive reaction with ‘CD28’, a single protein on the human white blood cell, soon became out of control, and the test subjects soon feared for their lives. Animal tests never predicted this and never could have done. As is standard practice in the drug industry, TGN1412 had been through animal trials, and passed. Particularly interesting were tests on cynomolgus monkeys, considered a good choice of test animal due to the nature of their white blood cells. Similarities with the human white blood cell are greater than many other animals that could have been used, particularly regarding CD28. The cynomulgus monkey has the amino acids in the same order as humans. [ Viewpoint, Lancet 2006; 368: 1387-91] As animal experiments are, this was a relatively well-designed one. Yet other differences existed – as they always do when comparing different species. As an expert stated “In animals binding may not occur because the antibody may not recognise any animal tissue at all, or binding may be weaker,” [David Glover, chief medical officer at Cambridge Antibody Technology, Times, 17/3/06]. Another species difference was that the antibody was human. In animals, the immune system rejected it before it had it’s full effect. (Times, 17/3/06) So for two reasons it was impossible for animals to have predicted this reaction. In animals, no reactions were going to result. With the availability of modern technology, there was no need to apply the inaccurate and flawed methodology of animal testing. However, it appears that the animal data gave the confidence to bypass the incisive techniques – which would have sounded a timely warning. Unfortunately, the effects of this disastrous day in March 2006 wasn’t the rare catastrophic drug trial that many were quick to claim. Over previous months more people had suffered and died as they took the risk of being the first humans to take medicines that had safely passed animal tests. 19 June 2005, Independent: Was a 19 year old student who hanged herself driven to suicide by the antidepressant she was testing for Eli Lilly? 17 March 2006 Trials of Eisai drug Aricept resulted in 11 deaths. Thalidomide was released in 1957 as a remedy for morning sickness in pregnant mothers and was sold in many different countries for four years. During that time it was linked to one of the most devastating medical disasters in history due to it’s cause of damage to the unborn child. Children were born with shortened limbs, condemning them to a life of disability. As was true of all medicines released from this time to the present day, Thalidomide was tested on animals. It has been claimed that it was passed safe because it was never tested on pregnant animals, although it is hard to argue this. Animal testing was an established procedure by then, and data from Germany (Thalidomide was released by a German company) indicates that it was. [Arzneimittelforschung, 1956;6:426-30]. However, this is not entirely relevant because tests on pregnant animals would never have predicted the terrible effects of this drug. It would be wrong to claim that Thalidomide causes no birth defects in animals. But the fact that they only resulted occasionally and at high doses was more indicative of safety than danger. The study of the use of animals to test for birth defects is interesting, and you are invited to the information covering the matter on this page.